When mission commander Neil Armstrong finally took the "small step," I was watching in the Fillmore West in San Francisco. In a corner of the huge concert hall they had a large screen showing man’s first steps on the moon. The activities at Tranquility Base fit right in with the light show. Where were you when Armstrong took that the "giant leap for mankind?" The following video is NASA's restored broadcast of the Apollo 11 extravehicular activity (EVA) on the surface of the moon. NASA reminds us that the Apollo 11 (EVA) began at 10:39:33 p.m. EDT on July 20, 1969 when Astronaut Neil Armstrong emerged from the spacecraft first. While descending, he released the Modularized Equipment Stowage Assembly on the Lunar Module's descent stage. A camera on this module provided live television coverage of man's first step on the Moon. 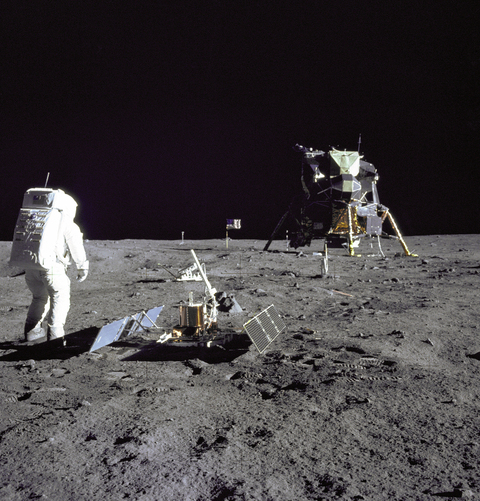 During this first visit to the Moon, the astronauts remained within about 100 meters of the lunar module, collected about 47 pounds of samples, and deployed four experiments. After spending approximately 2 hours and 31 minutes on the surface, the astronauts ended the EVA at 1:11:13 a.m. EDT on July 21. The Left-wing Liberal Netroots Nation protested for "water rights" in Detroit yesterday. Mark Ruffalo provided a little celebrity to the demonstration as he kicked off the Water March. "You built this nation, okay? And what's happening in Detroit is a model for what could be happening in this nation. Instead of a nation for the .001 percent, it's a nation for all." Ruffalo marched with the demonstrators for about 20 minutes as the protest moved through the streets of downtown Detroit. You can read more about the protest at TownHall.com and Truth Revolt. The protest flows from the Detroit Water and Sewerage Department shutting off water to customers that don't pay their bills, So far this year, Detroit's water utility has shut off water to 17,000 customers. The utility wants people to do pay their overdue bills. Some residents and protesters are upset that the city is doing this. One of the themes of the Netroots Nation 2014, or "Nutroots," as Senator Hatch christened them in 2007, is that water is a human right. The water protest is a misguided response to Detroit's water utility shutting off water of thousands of Detroit residents who failed to pay their bills. According to the Nutroots, these shut offs violate the "human right to water." The Nutroots take it even further claiming that the water cutoff is a threat to public health. As the activists get more attention, thanks to the Nutroots and activist celebrities like Ruffalo, the idea that Detroit is somehow violating human rights by requiring payment for providing potable water to residents is taking hold and becoming part of the Left's social injustice agenda. I agree that water is a human right. Like all "rights" water is a gift from God. Nevertheless, water that is treated to be safe for human consumption and distributed through a complicated networks of constantly maintained pipes is no longer a gift from God, but a human endeavor which must be paid for. Perhaps David Burge put it best, "Shame on Detroit, the only city in America that makes people pay water bills." If the water rights protesters have their way, Burge's take might seem strange.